Miramar is the third largest city in Broward County. Miramar has outstanding Public Safety Departments with a full-time staff of professionally trained and certified firefighters and police officers. The City has two water treatment plants, one wastewater treatment plant, and all other services necessary for the health and welfare of its residents. There are 22 neighborhood parks, one regional park and ten community parks in the city where athletic activities are available for sports enthusiasts. Miramar has been and continues to be a family-oriented community. The City’s professional recreational staff plans year-round activities geared to this strong family orientation with something for everyone, from “tiny tots” to senior citizens. There are many reasons Miramar has become a preferred locale for major corporations and Fortune 500 companies to call home. The City is centrally located between the Miami and Ft. Lauderdale metro areas and less than 30 minutes to the Miami and Ft. Lauderdale airports and seaports. 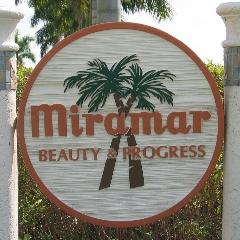 Miramar was named among the top 100 of “America’s Best Places to Live” by Money Magazine in 2006 and again in 2008.